Around the 15th of each month, the new Bon Appetit arrives at the doorstep of the bungalow. I tear through the plastic bag and give myself a quick couple of minutes to thumb through the new issue, scanning for which articles I’m going to devour first. And then I go back to whatever I’m doing, all the while plotting a time when I can sit on my couch and read it from cover to cover and plan out what recipes I’m going to try. I’m particularly tickled with the new issue, in part because it’s almost summer and I love summer food, but also because it’s chock full of inspiring images and recipes that I want to cook immediately. As someone who taught herself how to cook, I’ve found inspiration and guidance from the new stand for years. The ideas are fresh and of the moment, usually seasonal, and the best part is that in a matter of weeks, there will be a whole new crop (pun intended!) to be inspired by! 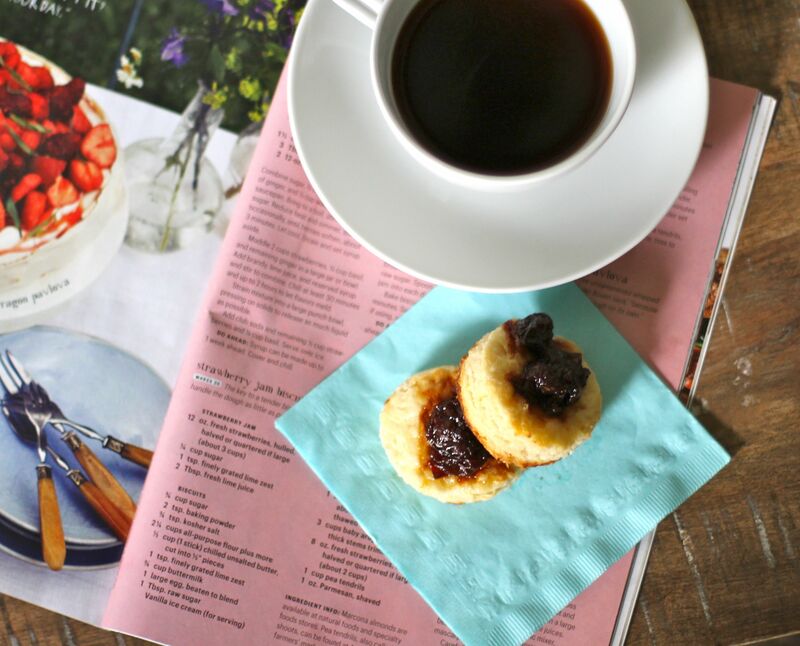 One recipe in particular caught my eye: strawberry jam biscuits. Just when I think the strawberries at the farmers market can’t get any better, the farmers bring even juicier, sweeter, and more fragrant berries for the picking (and enjoying!). And truthfully, anything that has to do with a biscuit is a winner in my book. Flaky, buttery pastry pairs well with summer strawberries, and so I added strawberries to my farmers market list on Wednesday before I realized… what about the giant bowl of pitted cherries in the fridge? And then a moment of brilliance, if I don’t say so myself: sub in cherries for the strawberries in this recipe and everybody wins…especially me! The recipe suggests serving the biscuits with ice cream, which sounds heavenly to me. But I also feel like this is a perfect breakfast treat, one that I’d love to enjoy on a lazy Sunday morning of a holiday weekend. So I made (and ate) these for breakfast. Don’t mind my coffee cup that’s hanging out in one of the photos. I followed the recipe but used cherries and lemon instead of strawberries and lime. Start by making a quick jam: add cherries to a saucepan, add sugar, cook down for about 10-12 minutes or until they’re soft and syrupy. Then add lemon zest and lemon juice. 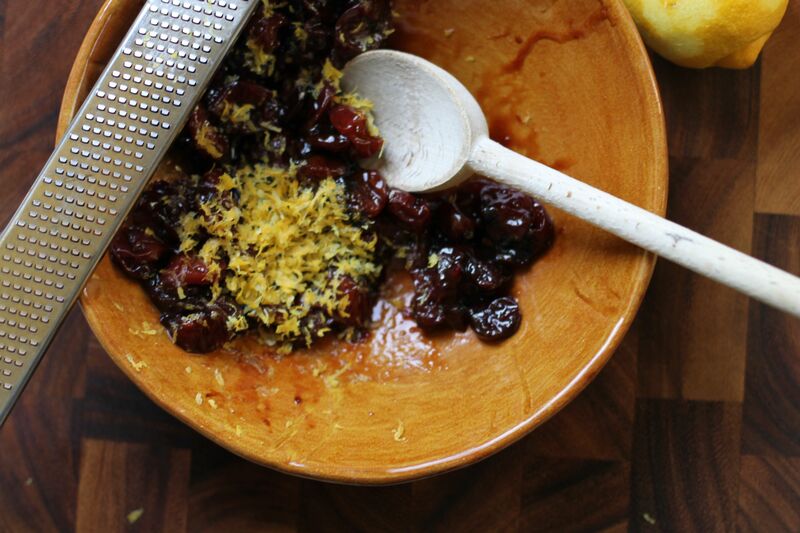 The acidic lemon really brightens the sticky, caramelized jam. 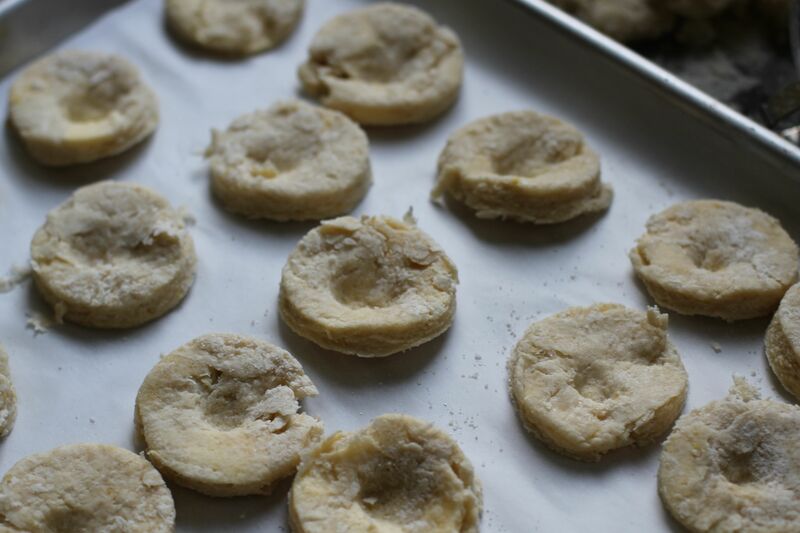 The key to flaky biscuits is cold butter and a hot oven. I had the hot oven, no problem, but hot oven = a hot kitchen. So I cut up my butter into little chunks and then put it back into the fridge while I prepped the rest of the ingredients. 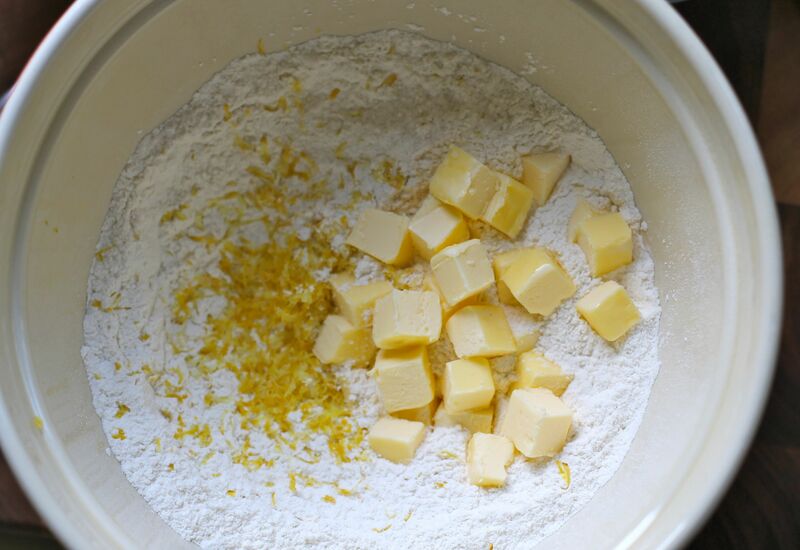 Make the biscuit dough by starting with flour, sugar, and baking powder, then add lemon zest and the cold butter. 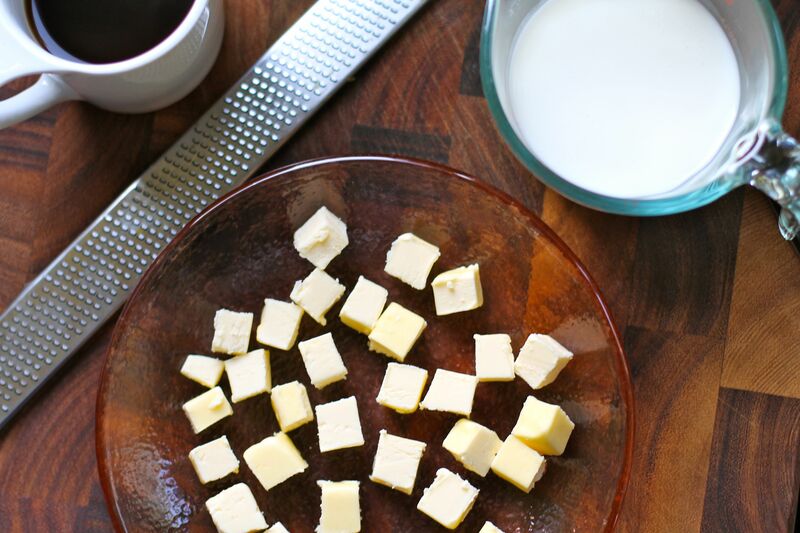 Once the buttermilk is mixed in, roll out the dough and cut. 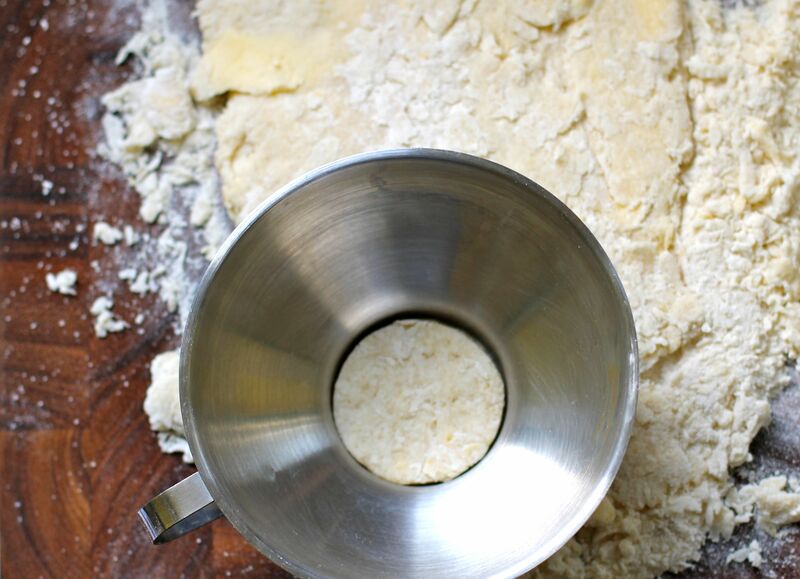 Here I used my wide-mouth funnel because it has a handle and the metal cuts right through the buttery dough. Next comes the fun part, and if you have kids you should recruit them to come and “play with their food” by making thumbprints in the middle of each biscuit. This was my favorite part! And now spoon in that devilish cherry jam. In the original recipe, theoretically there is extra jam to serve the finished biscuits with. I showed absolutely no restraint and doused my biscuits in cherry jam. I’d rather have more cherry jam baked into the biscuit than served alongside it. What I really love about this recipe is that it truly feels fresh. A standard biscuit with any jam is a treat! 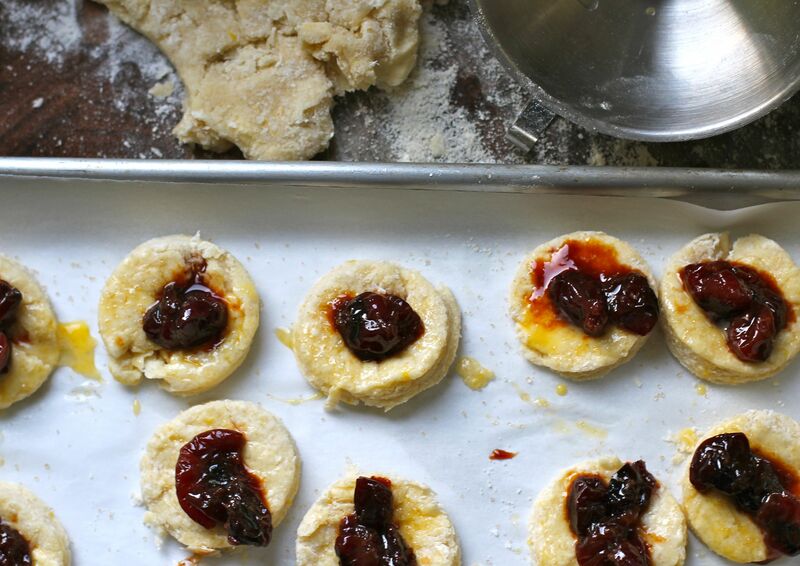 The biscuits here are well-flavored by the heavy dose of lemon zest and buttermilk, tangy and interesting on their own, not just a buttery carrier for good jam. The original recipe calls for the combination of lime and strawberries, which sounds ridiculously delicious to me. I just might have to pick up some strawberries next week and make the original version. Until then, I’ll be reading through the rest of the issue with a couple of biscuits and a cup of coffee. I hope you find a moment to sit down and enjoy a special treat over the holiday weekend!